Cell types that are unique to nervous tissues can be classified into 3 major groups: neurons, macroglia, and microglia. Historically, conventional stains like H & E were inadequate for revealing the complex inter-relationships among these different cell types. However, this limitation was overcome with the creation of special histological stains around the turn of the 19th century by neurohistologists such as Santiago Ramon y Cajal and Camillo Golgi. The metal impregnation stains they formulated reacted specifically with different elements of the CNS. With the advent of the electron microscope in the 1950s, the subcellular details of neurons and glia were revealed and the inter-relationships between different cell types became better appreciated. Although the metal impregnation techniques were powerful, they were capricious. 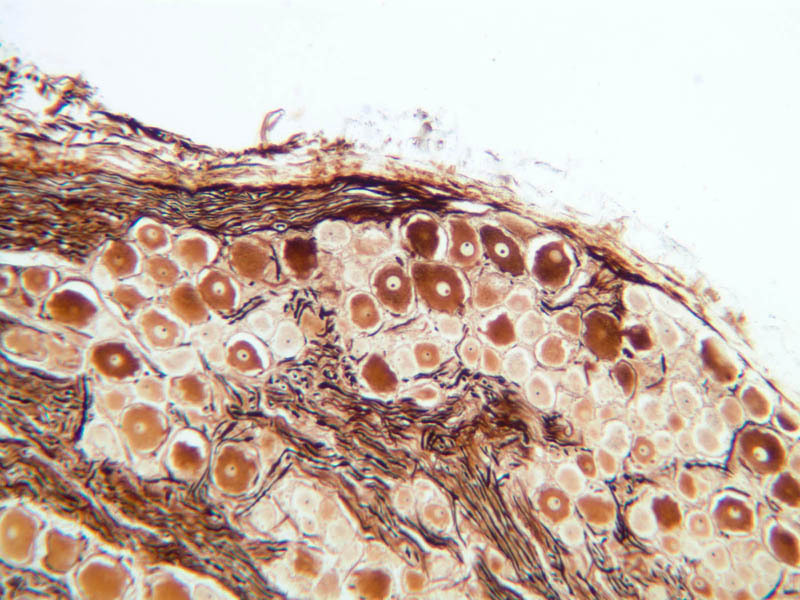 Presently immunohistochemistry is widely used for discerning different cell types in the nervous system. Your slide set contains sections stained using metal impregnation methodology, H&E and Cresyl Violet, and you should familiarize yourself with the EM’s in your text. In addition, Caramates in the laboratory contain photographs of neurons and glia stained using cell type specific antibodies. To begin your investigation of the cell types in nervous system, start with a rather simple part of the nervous system - a dorsal root ganglion (DRG). Nerve cells cluster together to form groups of nerve cell bodies that are referred to as ganglia. The ganglia known as DRGs belong to the peripheral nervous system (PNS). The neurons that populate DRGs are pseudounipolar neurons; that is, they have a single process that leaves the cell body and immediately branches to form one process that projects into the central nervous system (CNS) and another process that projects into the PNS. The process that projects in the periphery innervates sensory receptors. Both processes are morphologically and functionally axons, which, for this reason makes sensory neurons unique. These processes travel extensive distances, often a meter, and are supported by nutrients transported from the neuronal cell body. 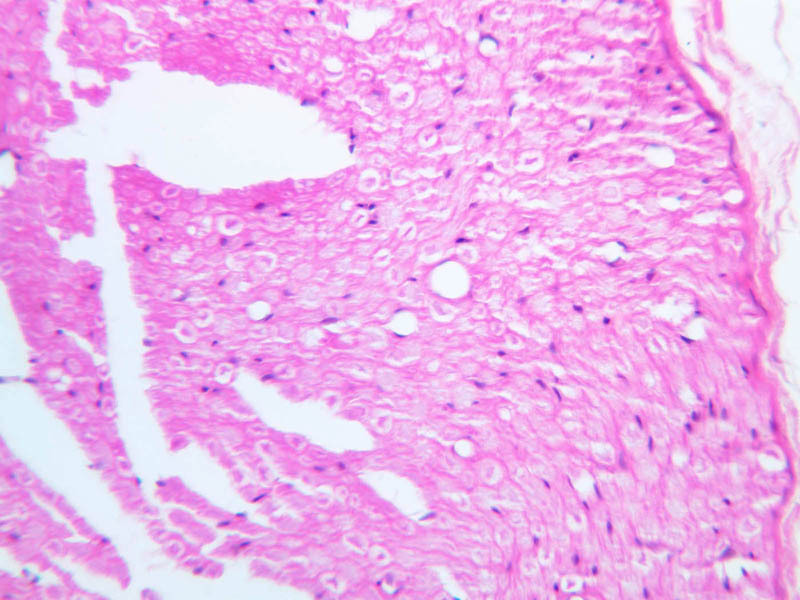 Begin by examining slide A-90 using the 10X objective (slide A-90, DRG [2.5x, 10x, 20x, 40x-labeled]. The ganglion is populated by the cell bodies of sensory neurons as well as glial cells known as satellite cells. Within the ganglia the neurons are the large cells that have large, basophilic nuclei with prominent nucleoli. Find the ganglion and identify the neurons. The axons of neurons have very small diameters so they are almost impossible to locate on slide A-90, which was stained using H & E.
However, the cytoskeleton within the axons of neurons can be visualized using silver impregnation (slide A-89 [10x, 20x, 40x]). On this slide, the neuronal cell bodies appear yellow-brown, whereas the neurofilaments that comprise the cytoskeleton of the axon are agyrophilic, and, hence, appear dark purple to black. Neurons are surrounded by supporting cells broadly classified as neuroglia. 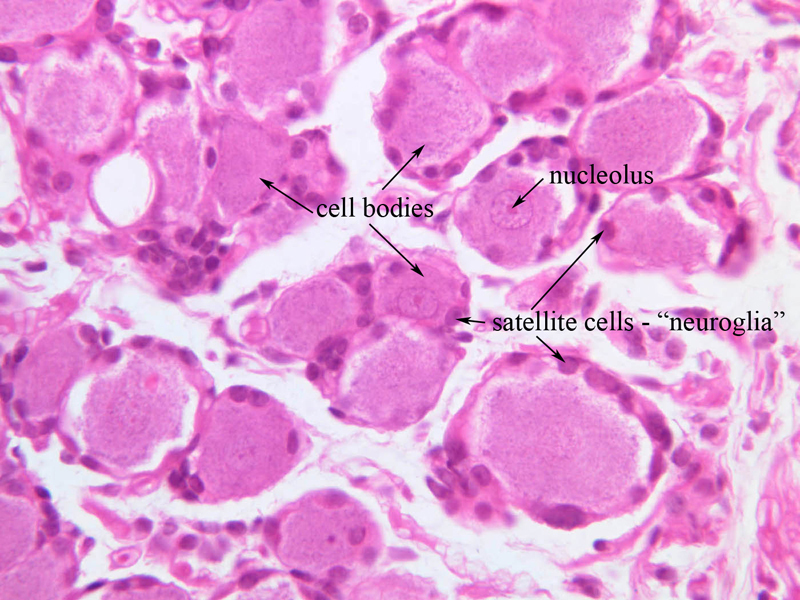 In peripheral ganglia these cells are known as satellite cells because they appear to orbit the neuronal perikaryon. The processes of the DRG neurons are ensheathed by a related cell known as a Schwann cell. Depending on the diameter of the axon, Schwann cells will either produce a multilamellar membrane known as myelin or they will make only one wrap around the axon (ensheathment). Small fibers are ensheathed while large axons are myelinated. Each myelinated internode is formed by one Schwann cell. A myelinated axon is like a “pig in a blanket” where the hotdog represents the axon, and the biscuit wrapped around it represents the myelin. Myelination speeds up the rate of conduction by preventing longitudinal current from leaking out of the axon and effectively increasing the axons length constant. However, because current can still leak out of an axon as signals travel down its length, specializations (known as Nodes of Ranvier) actively regenerate those signals. These nodes are separated by myelinated internodal segments. Little current will flow in and out of the axon at these internodal segments, whereas at the Node of Ranvier current will flow maximally should the membrane reach a threshold voltage. In essence, these signals, known as action potentials, will jump from one Node of Ranvier to another Node of Ranvier in a process called salutatory conduction. Myelin is discussed below in the context of the nerve. A nerve is a collection of axons from cell bodies in the PNS or CNS that are grouped together by non-neuronal cells, and embedded in connective tissue sheaths. 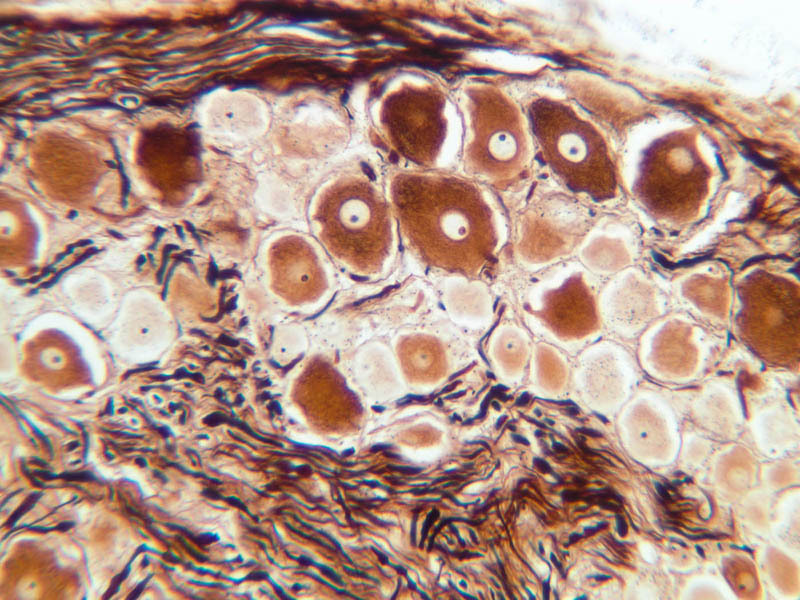 Inside the connective tissue sheaths, bundles of axons are grouped together to form nerve fascicles. Most axons within a nerve are myelinated. In longitudinal sections, the myelin sheaths are strung out along the axon like a string of sausages. 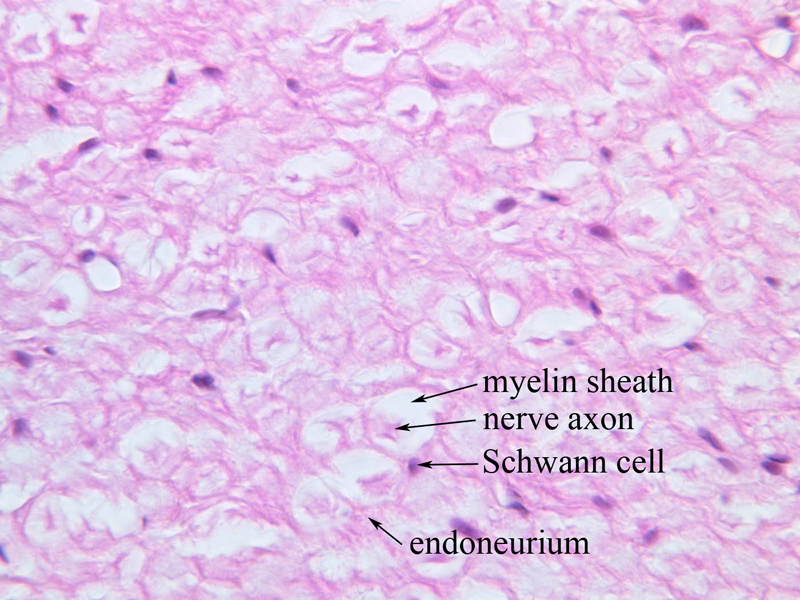 An individual axon may be myelinated by Schwann cells or groups of axons may be ensheathed by Schwann cells. 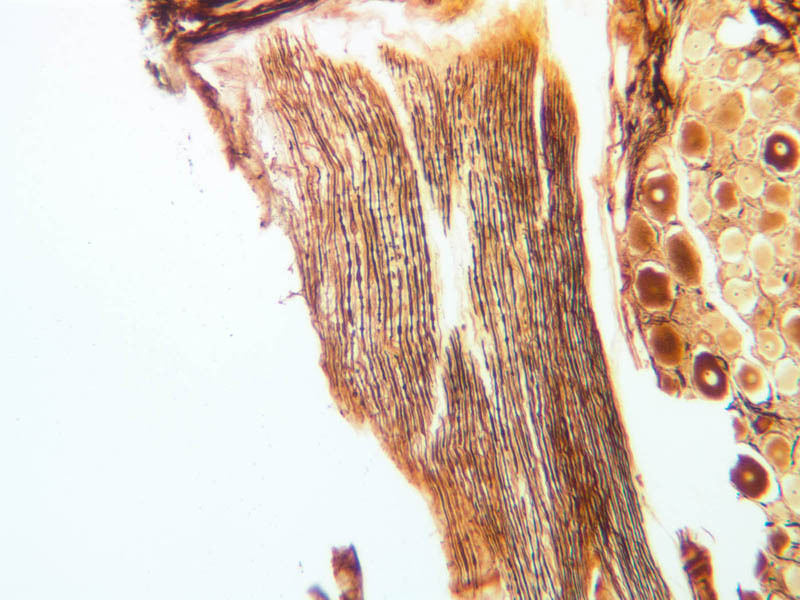 Individual myelinated fibers in H&E stained cross sections of nerves look like cartwheels, where the spoked portion represents the former location of myelin and the hub represents the axon. 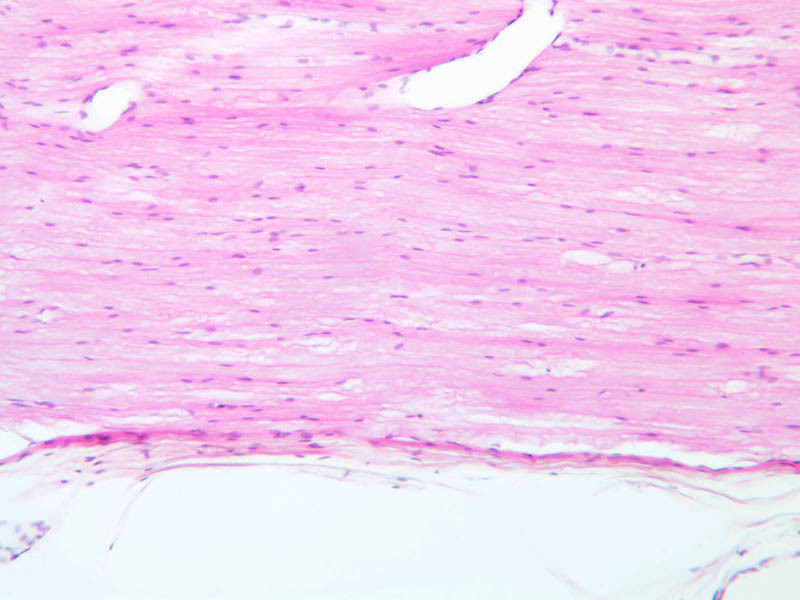 Because myelin is mostly lipid, it is extracted during the paraffin embedding procedure that is part of standard histological tissue preparation, hence it does not stain well with H & E. Unmyelinated fibers will appear as the axial circlet without a surrounding cartwheel. 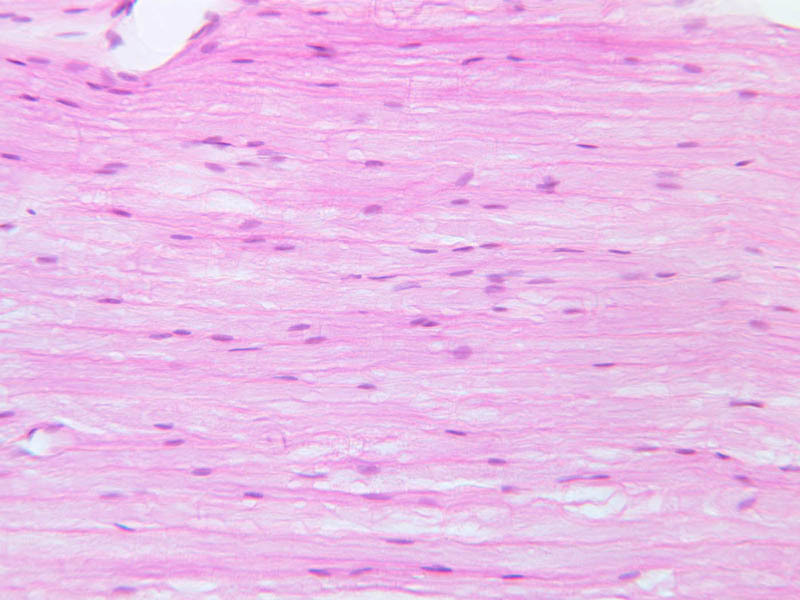 Unmyelinated fibers are usually smaller than myelinated fibers and hence will be difficult to see at the light microscopic level. Examine slide A-80 which contains both a cross-section ([10x, 20x, 40x] [10x-labeled, 20x, 40x-labeled]) as well as a longitudinal section ([2.5x, 10x, 20x, 40x] [10x, 20x, 40x]) of a peripheral nerve stained with H & E. First examine the nerve cut in cross section at 10X. You should be able to discern the connective tissue sheath around the nerve and the fascicles of axons within the nerve. 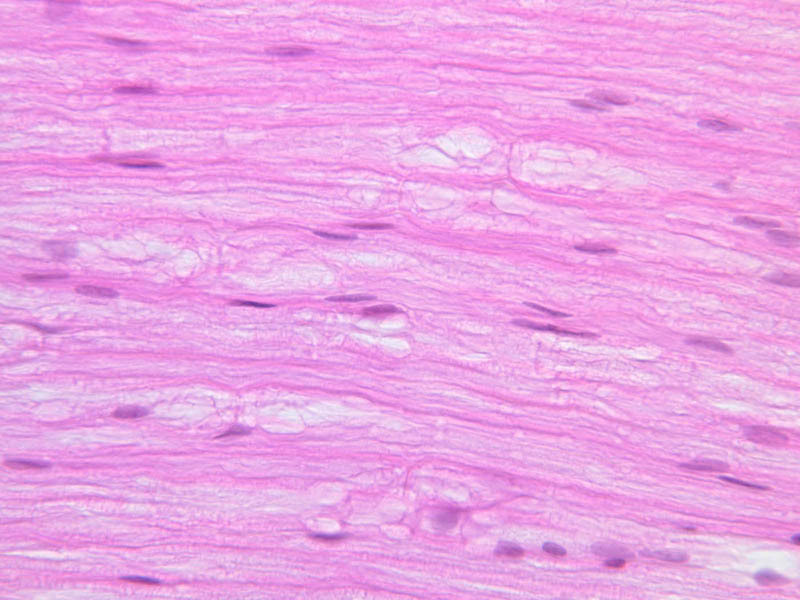 These fascicles are bound together by a connective tissue sheath known as the epineurium. 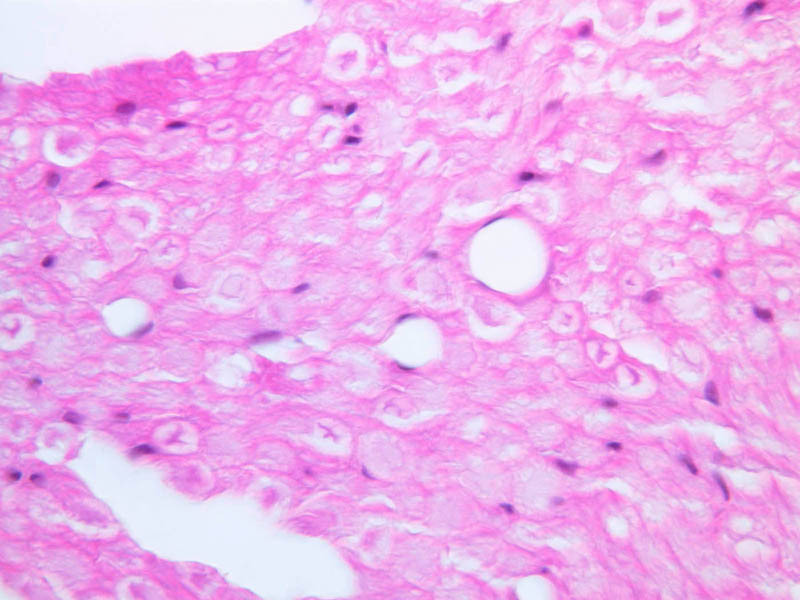 The epineurium consists of both dense irregular and loose connective tissue and frequently contains small patches of fat. Within the epineurium there are bundles of axons grouped into fascicles. Each fascicle is surrounded by another connective tissue covering, the perineurium. 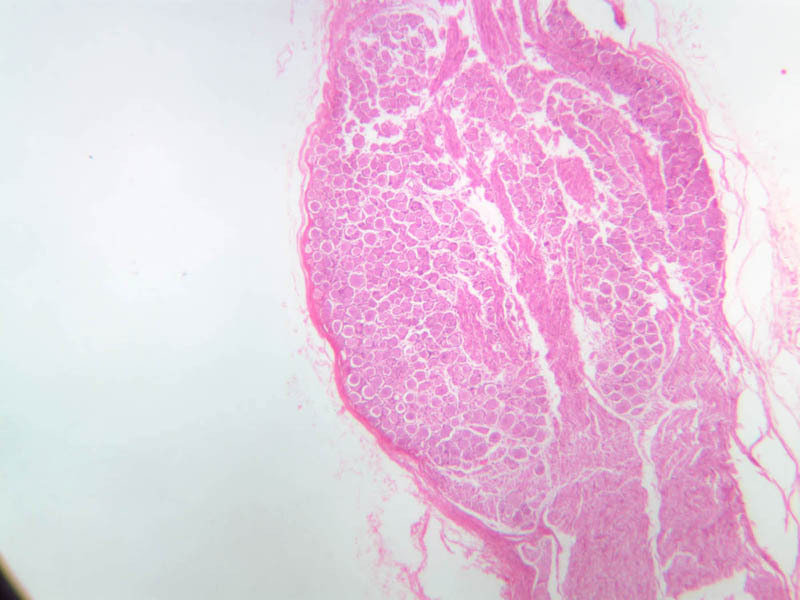 The cells of the perineurium have an epithelioid appearance with flattened nuclei. Perineurial cells are closely apposed to each other forming an uninterrupted concentric sheath around the fascicle that is several layers thick. Small blood vessels penetrate the perineurium and end in capillaries among the individual nerve fibers. 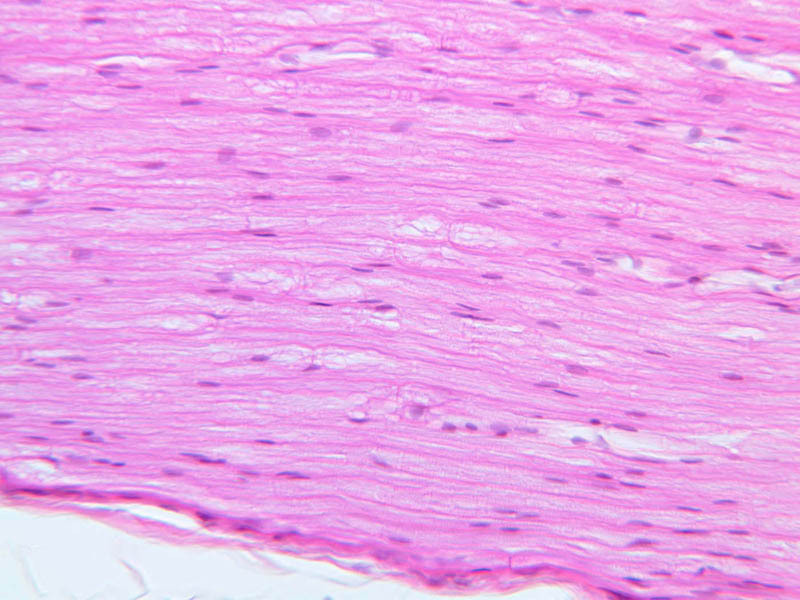 Within the fascicles, the Schwann cells secrete a basal lamina. 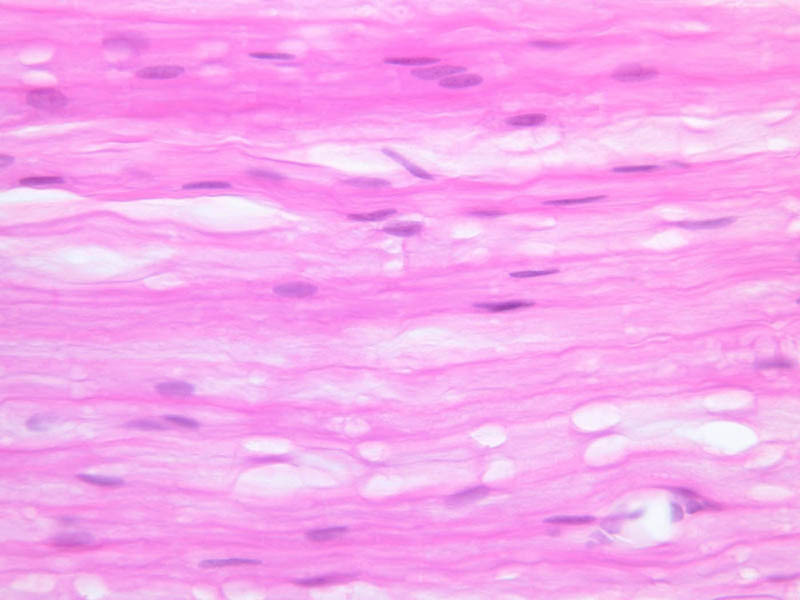 Immediately adjacent to this basal lamina is loose connective tissue referred to as endoneurium. 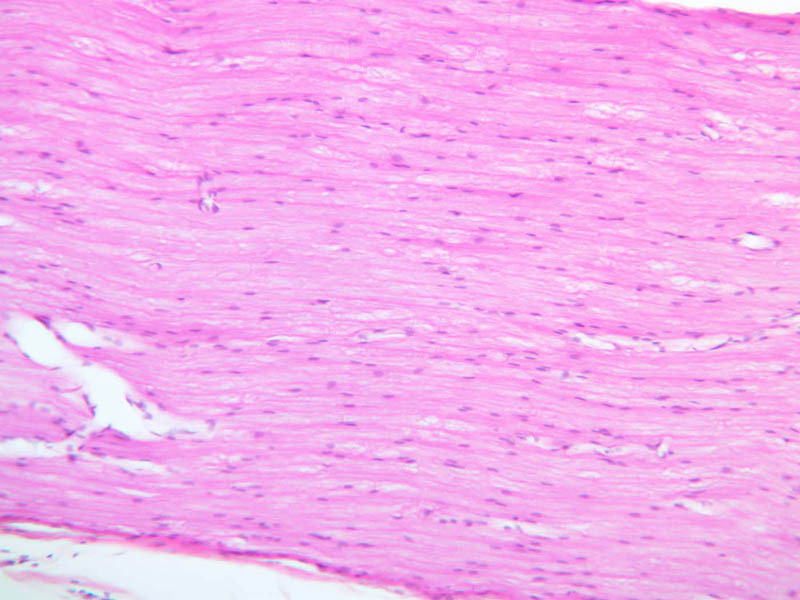 Looking at the nerves in cross section at 40X you should be able to see individual myelinated axon cylinders. Notice that the axon cylinders are of different sizes. Why is this so? You will also see many nuclei. 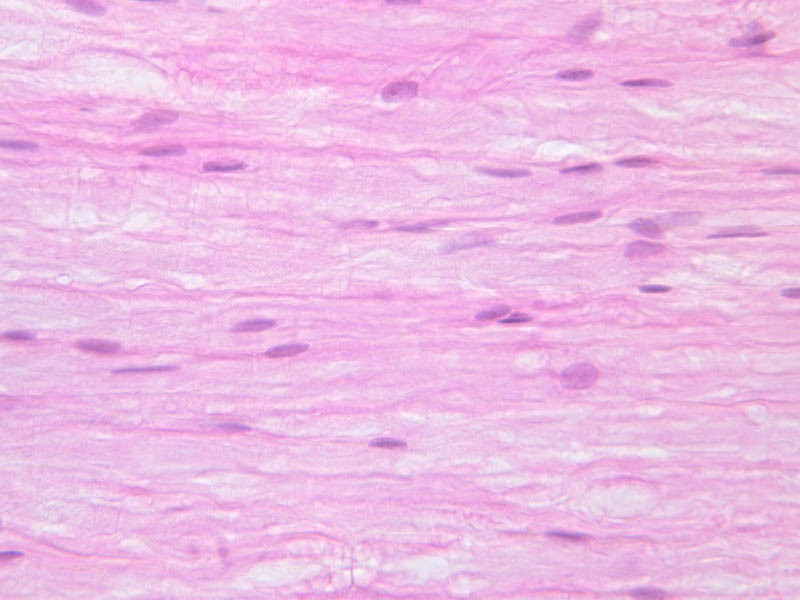 The majority of the nuclei present in these sections will be those of the Schwann cells since there is a one to one relationship between the Schwann cells and the myelin sheaths. 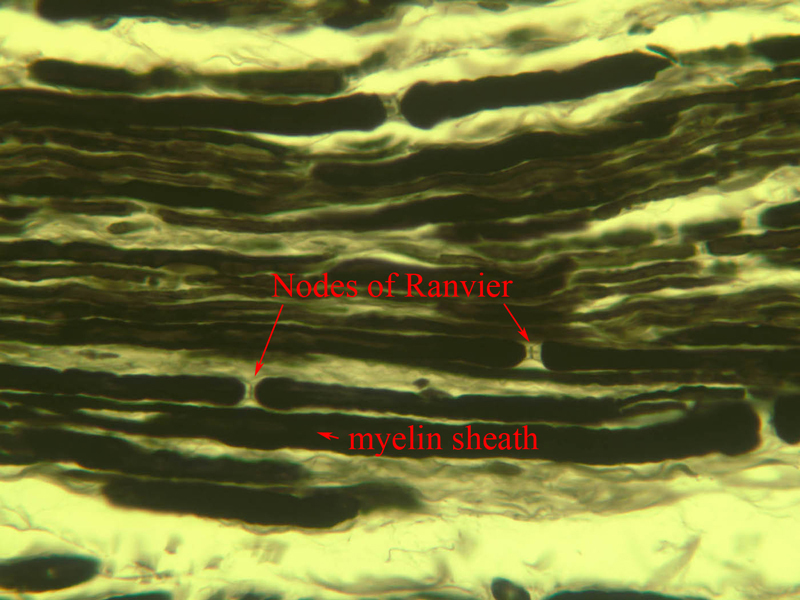 At regular intervals, the myelin sheaths pinch inward toward the axon at the Node of Ranvier. 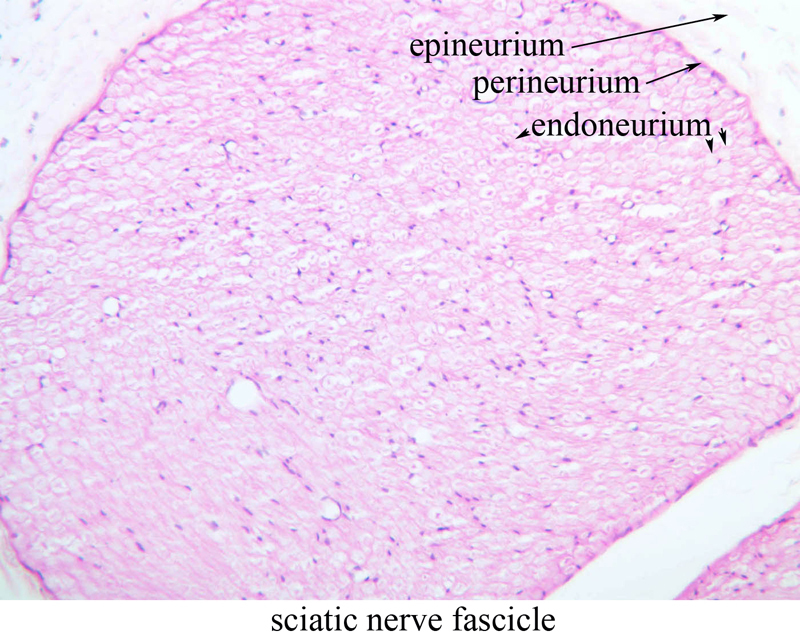 Examine the longitudinally sectioned sciatic nerve on slide A-80 ([10x, 20x, 40x]) and try to find a Node of Ranvier. Look for the gaps that occur at regular intervals between myelin segments. Actually, these will be difficult to find on this slide. 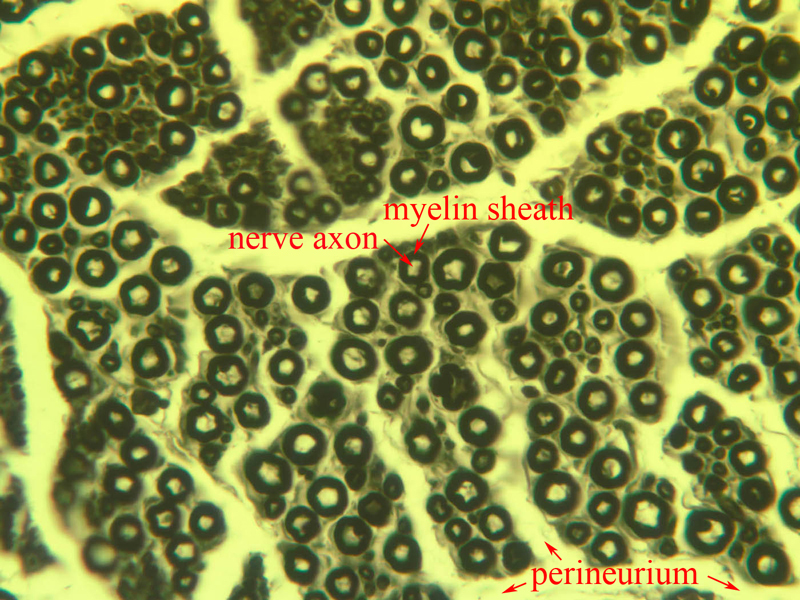 Nodes are more easily visualized in preparations where the myelin sheath has been stained. Since myelin is a complex specialization of the Schwann cell membrane, and it contains a significant amount of lipid, it stains extremely well with osmium. 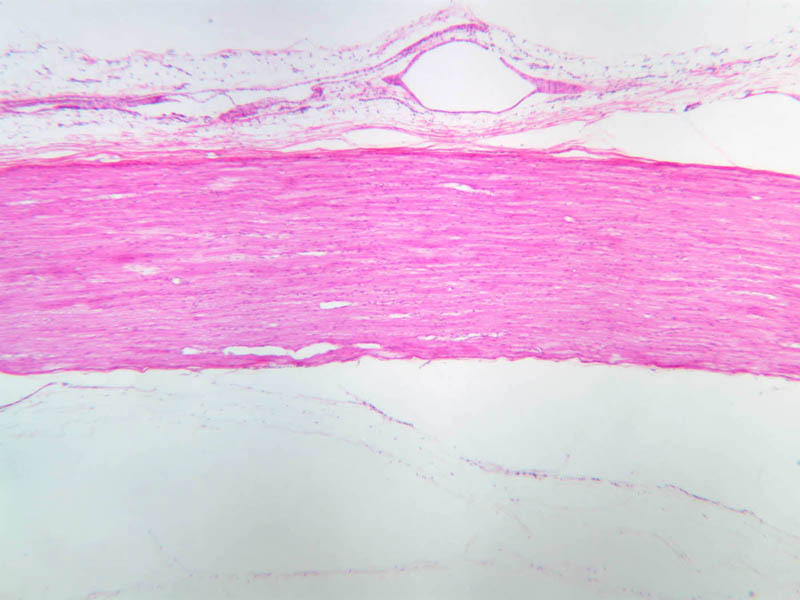 Slide A-86 contains both a cross-section ([10x, 20x, 40x-labeled]) as well as a longitudinal section ([2.5x, 10x, 20x, 40x-labeled]) of sciatic nerve stained with osmium. The myelin, as well as fat, will stain dark black. Look at the longitudinal section on slide A-86 for the gaps which are Nodes of Ranvier (but don’t be fooled by cracks in the tissue). 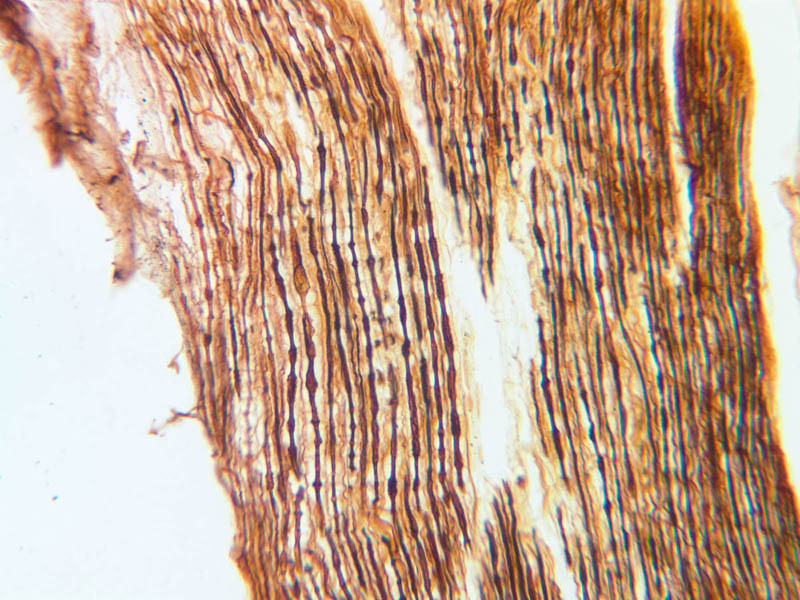 Examine the cross section of nerve on this slide as myelinated axons are readily apparent. At 40X, notice that some myelinated axons are larger than others. 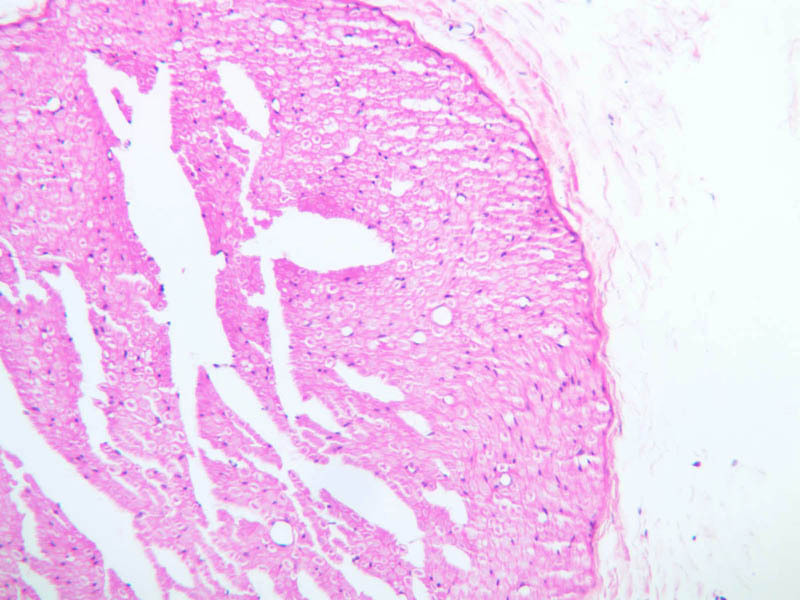 What do the unstained areas within the nerve represent? Also examine dorsal root ganglion (slide A-89 [10x, 20x, 40x]), which was stained using a silver impregnation stain. Notice the markedly stained knots along the stained processes which are the Nodes. The fine structure of peripheral nerves can be best appreciated at the EM level. Within the myelin there are cytoplasm-rich regions called Schmidt-Lanterman clefts (or incisures). These clefts allow the components in the myelin to be replaced, since these clefts are continuous between the inner and outer loops of the Schwann cell. In the CNS neuron cell bodies, their dendrites, and the initial portions of their axons are located exclusively in the gray matter. The axons of many neurons leave the gray matter bundled together with other axons to form the white matter tracts. This area appears white in the fresh state because of the many myelinated axons within it. The white matter is much like a peripheral nerve in appearance and the majority of the nuclei in the white matter are those of the neuroglial cells (the remainder are those of endothelial cells of the brain capillaries). The basic structure of neurons in the CNS is not very different from that of neurons in the PNS, such as the DRGs. The cytoplasm of neurons contains granular basic material referred to as Nissl bodies. 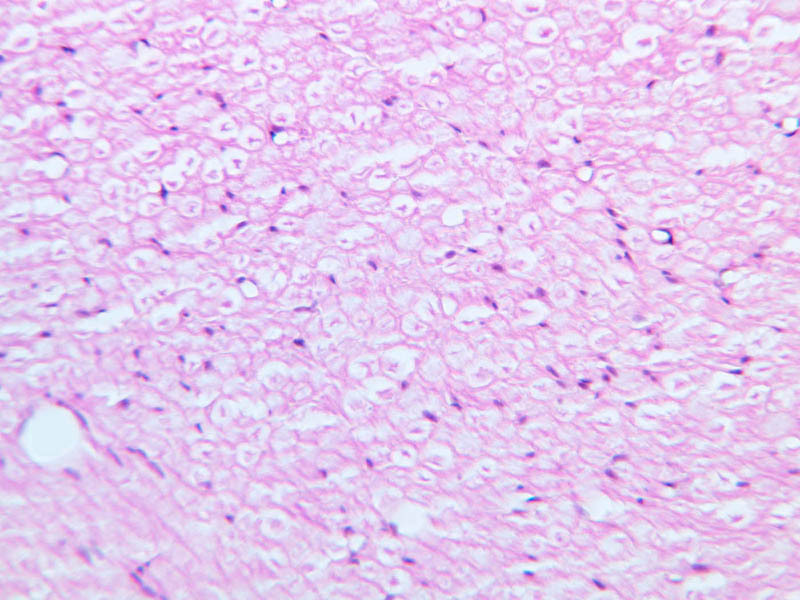 These clumps are masses of rough endoplasmic reticulum (RER). A large golgi apparatus is present as well. Nissl bodies stain adequately with H&E and even better with cresyl violet (CV), a stain for RNA and DNA. On the following slides look in the gray matter and find the motor neurons that reside in the ventral gray matter. Then look in the white matter to find the macroglial cells of the CNS, astrocytes and oligodendrocytes. 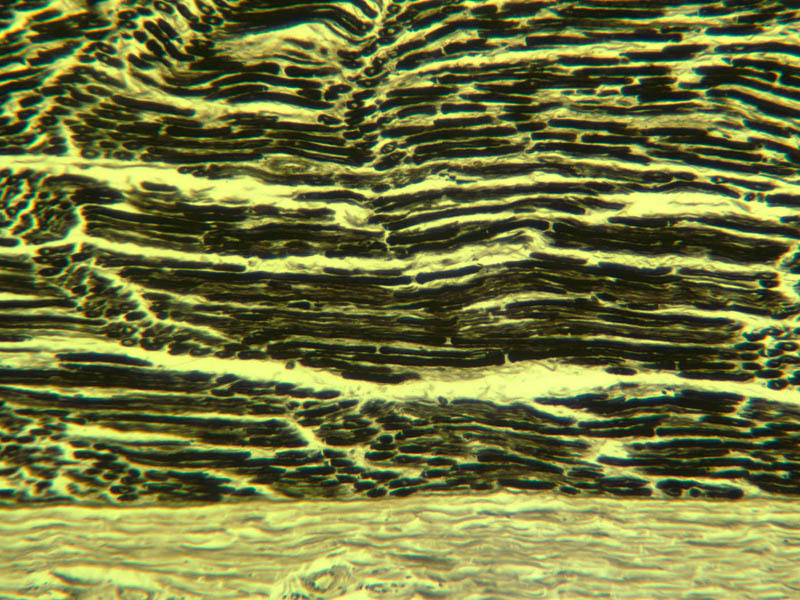 Examine the sections on slide A-85 with the unaided eye. Find the gray matter located within the interior of the cord (it has a "butterfly" shape). Examine the cresyl violet (CV) stained section first (the bluer one). 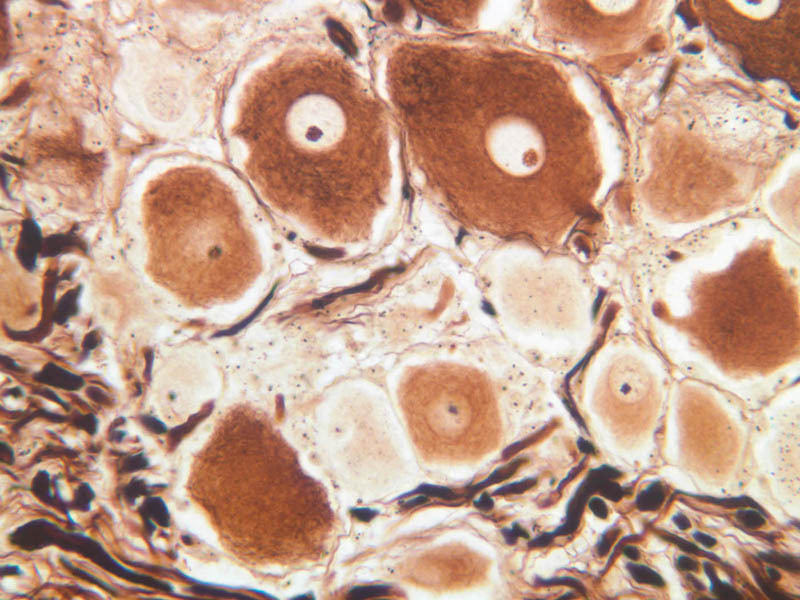 Find the ventral horn under the microscope and locate the cell bodies of the large motor neurons (A-85, CV [1x] [2.5x-labeled, 10x, 20x, 40x] [2.5x, 10x, 20x, 40x-labeled]; H&E [1x] [2.5x-labeled, 10x, 20x, 40x-labeled]). Motor neurons are among the largest cells in the nervous system, particularly when their long processes are considered. 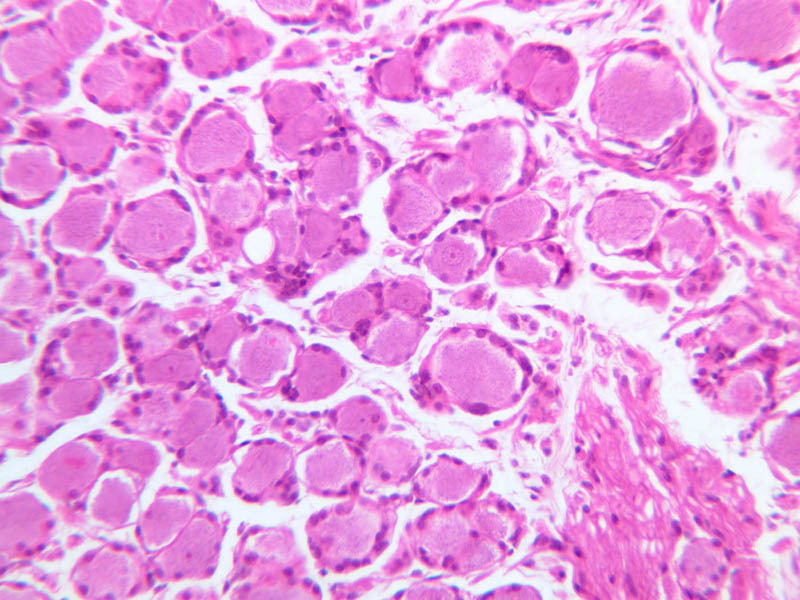 Once again, note the large nucleus, the prominent nucleolus, and the clumps of darkly stained Nissl bodies. Look for neuronal processes – these will not be stained well with the cresyl violet stain (what does this tell you?). 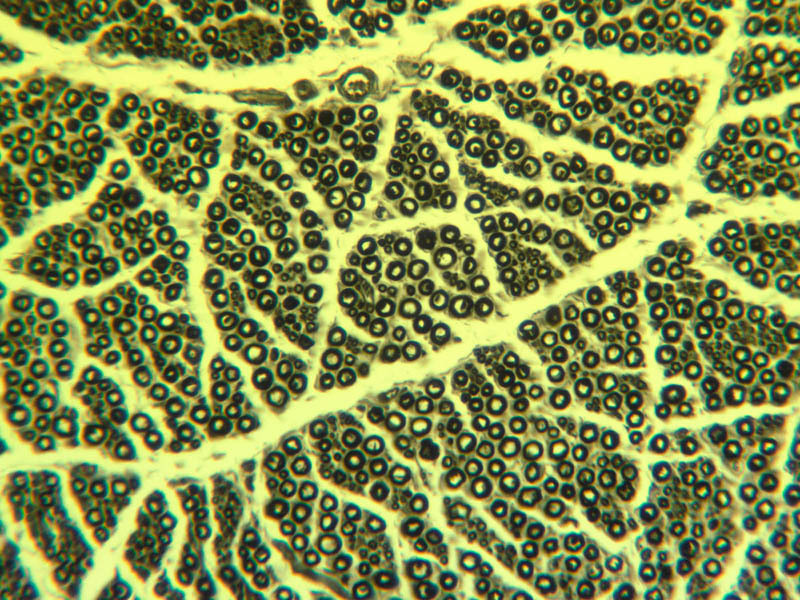 Dendrites are numerous and exit the cell as thick trunks that branch extensively. The axon hillock may also be seen as a thick trunk exiting the cell body, but this does not contain Nissl bodies as the dendrites do. Next, examine the dorsal horn (CV [2.5x, 10x, 20x, 40x]) and compare it to the ventral horn. Also examine the white matter (CV [2.5x, 10x, 20x, 40x]; H&E [2.5x, 10x, 20x, 40x-labeled]). Axons are more difficult to identify because they exit the soma as thin processes, and the irregular course they take makes them difficult to follow in sections. The term neuropil refers to the complex, felt-like net of axonal, dendritic, and glial arborizations that form the bulk of the gray matter of the CNS and in which the nerve cell bodies are embedded. 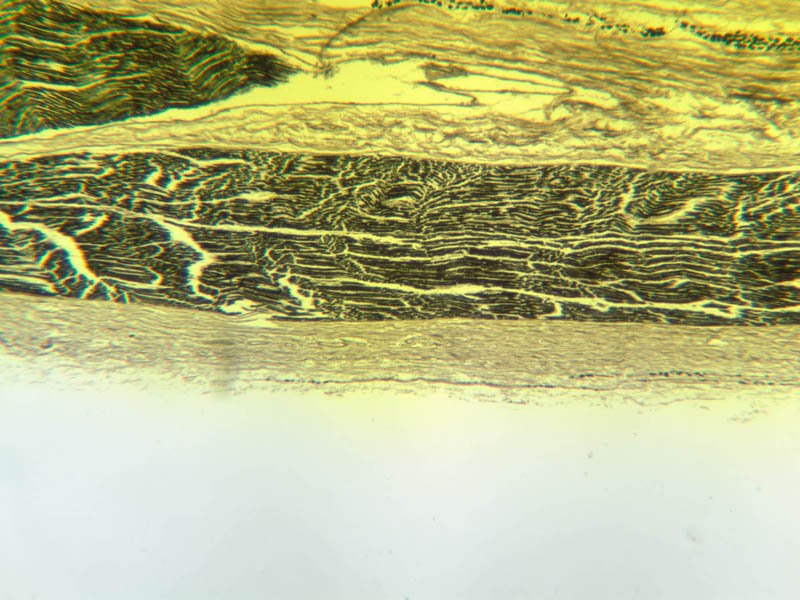 To appreciate the complex wiring of the CNS, examine slide A-83 (Sevier Ag [2.5x, 10x, 20x, 40x]), which is a section from the brainstem stained using a silver impregnation technique. The CNS is a densely packed tissue comprised of neurons and their processes as well as a number of non-neuronal, or neuroglial cells. Neurons and their processes are surrounded and ensheathed by various types of glia. In contrast to the PNS, there is no vascular connective tissue stroma surrounding neurons in the CNS. The glia in the CNS can be divided into the macroglia, which consist of the astrocytes and oligodendrocytes, and the microglia, which are macrophage-like cells. Among the macroglia, oligodendrocytes are most prevalent in the white matter where they function like Schwann cells to produce and maintain CNS myelin. Unlike Schwann cells, which myelinate a single internode, an oligodendrocyte may myelinate up to 30 individual myelin internodes. In slide A-82 of spinal cord, find the white matter (A-82, H&E [10x, 20x, 40x] [20x, 40x-labeled]), which surrounds the gray matter ([2.5x, 10x, 20x, 40x]). Does its appearance remind you of a peripheral nerve in cross section? The white matter is comprised of axons that originate from neuronal cell bodies lying in the gray matter of either spinal cord, brain, or spinal ganglia. Axons in the white matter can be thought of as parallel cables that ascend or descend the length of the spinal cord. The white matter does not contain any neuronal cell bodies, thus the nuclei present in this area are those of oligodendroglia, fibrous astrocytes, microglia, or endothelial cells. 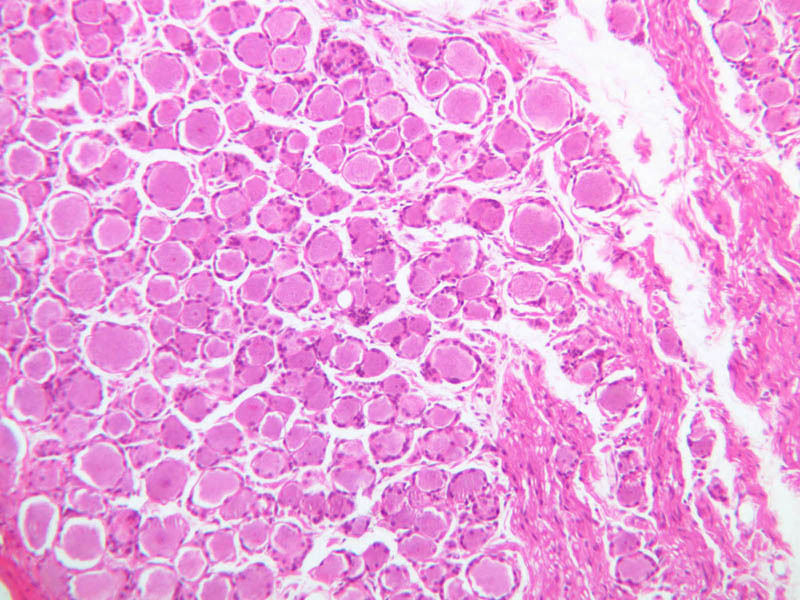 These cells become readily distinguishable with immunohistochemistry. On slide A-88 (H&E of spinal cord cut longitudinally [2.5x, 10x, 20x, 40x-labeled] [10x, 20x, 40x-labeled]) look in the white matter at the edges of the section for small cells with darkly stained, round nuclei. These will be oligodendrocytes. In particular look for rows of adjacent oligodendrocytes. Also situated among the nerve fibers in the white matter are fibrous astrocytes. 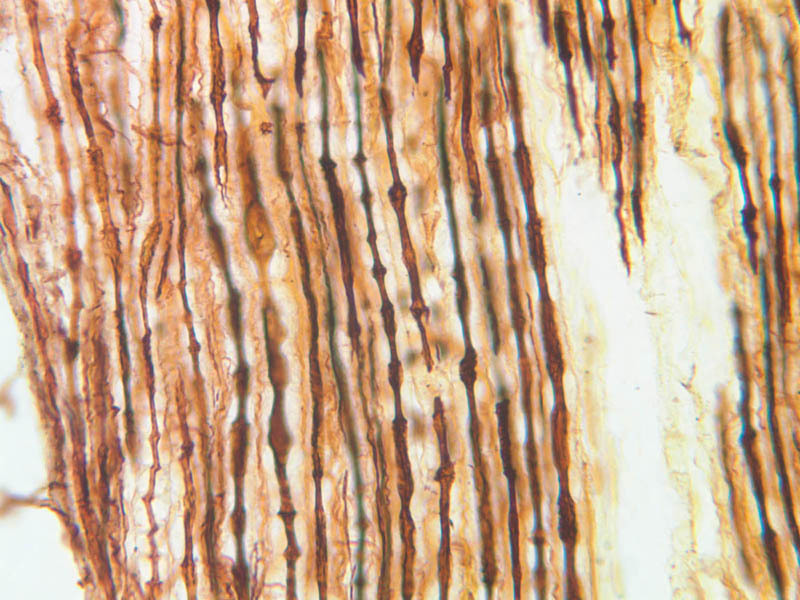 These are easier to find in the white matter of the spinal cord in cross section (slide A-82). Astrocytes have star-like morphologies and often the process of one astrocyte will abut the process of an adjacent astrocyte. White matter astrocytes also have a larger nucleus than the oligodendrocytes, and astrocytic nuclei are oval in contrast to the spherical nuclei of oligodendrocytes. Also, examine the caramates for examples of immunohistochemically stained oligodendrocytes, astrocytes and microglia. Without special stains it is almost impossible to positively identify microglia. These cells will have dark, thin, elongated nuclei. They are readily apparent using immunohistochemistry with antibodies that label monocytic lineage cells or with specific lectins. 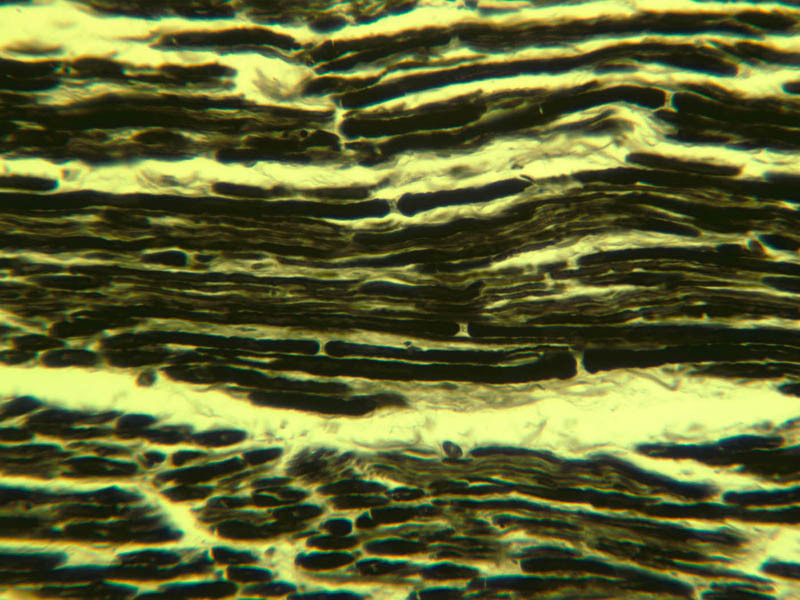 Closely observe the cross section of the spinal cord in slide A-82. The central grey matter contains numerous large neurons and the eosinophilic ground substance is the neuropil. Many of the nuclei between the large neurons are neuroglial cells. Because of their gray matter location these would be either oligodendrocytes or protoplasmic astrocytes. The astrocytes within the grey matter are difficult to positively identify without immunohistochemistry. In the cerebellum nerve cell bodies are organized in more sharply defined layers. The cerebellum consists of a cortex of gray matter which has an irregular contour due to numerous folds and a medullary center of white matter. Thus, unlike the spinal cord, the cerebellar white and gray matter are in reverse locations. In this phylogenetically older CNS structure, the gray matter consists of three layers, the molecular layer, the Purkinje cell layer, and the granule cell layer. The "newer" cerebral cortex, or neocortex, by contrast, has 6 layers. Examine slide A-84 (human cerebellum, H&E [2.5x, 10x, 20x, 40x] [2.5x, 10x-labeled, 20x, 40x] [2.5x, 10x, 20x, 40x-labeled]) with the naked eye and note a dark band about 1 mm from the convoluted surface. On examination at low power under the microscope this band can be seen to contain many round blue-staining nuclei of very small neurons - the granule cells. 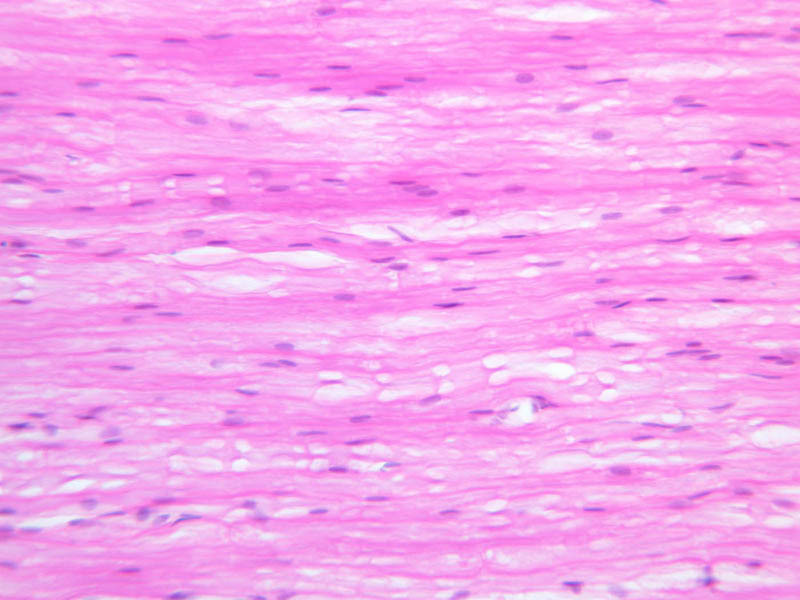 The pink-staining band next to the surface contains few nuclei and is called the molecular layer. Sandwiched between these two layers is a single row of large neurons known as Purkinje cells (they are hard to see on this specimen). Examine slide A-79 (cresyl violet [2.5x, 10x-labeled, 20x, 40x] [2.5x, 10x, 20x-labeled, 40x-labeled]), which is a preparation from rodent cerebellum. Identify the three layers of the cerebellar cortex, and in particular seek out the Purkinje cells. 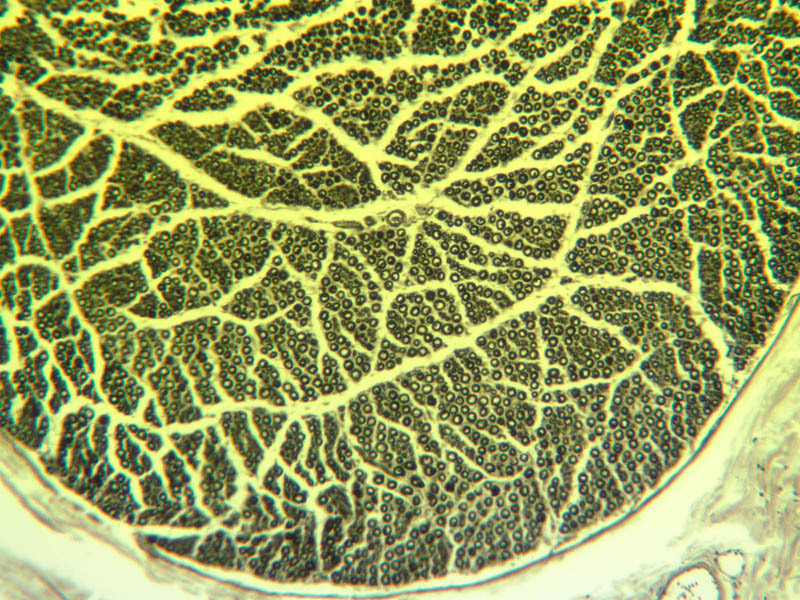 Find examples of the large dendrites that leave the Purkinje cell perikaryon and extend into the molecular layer. Purkinje cell axons extend from the basal pole of the cell into the granule cell layer, but they are infinitely more difficult to find than dendrites. Compare the sizes of the neurons in the Purkinje cell layer to those in the granule cell layer. 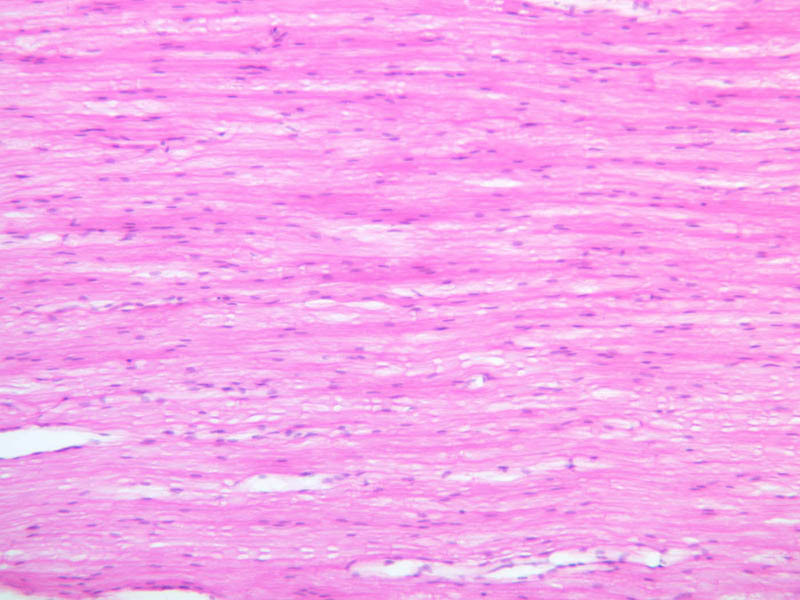 On Slide A-79 notice the choroid plexus ([2.5x, 10x, 20x, 40x] [2.5x, 10x, 20x, 40x]), a coiled structure located in the fourth ventricle, which is at the base of the cerebellum. The choroid plexus is a tangled mass of blood vessels and modified ependymal cells that is responsible for producing cerebrospinal fluid. Because of the highly complex organization of nervous tissue, many special stains were developed to reveal particular cellular elements. Specimens stained using osmium or silver provide a means to observe many of these features. However, given the density of cellular profiles, it is only by electron microscopy that all of the components of the nervous system can be identified in a single tissue section. Observe the electron micrographs in the text. In the cytoplasm of the neuron there are large amount of RER. Since this organelle is essential for synthesizing proteins, what does its abundance tell you about the level of protein synthesis in neurons? Electron microscopy also has been essential to reveal the structure of synapses, which are the functional connections between neurons. Due to their small size, synapses are too small to observe at the light microscopic level.